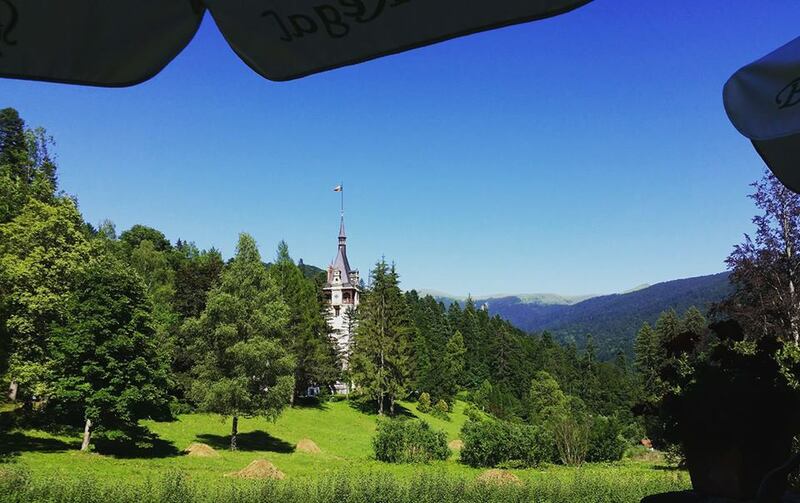 Heidi Wanders the World: Top 8 Reasons to Book Your Next Vacation to Transylvania, Romania! 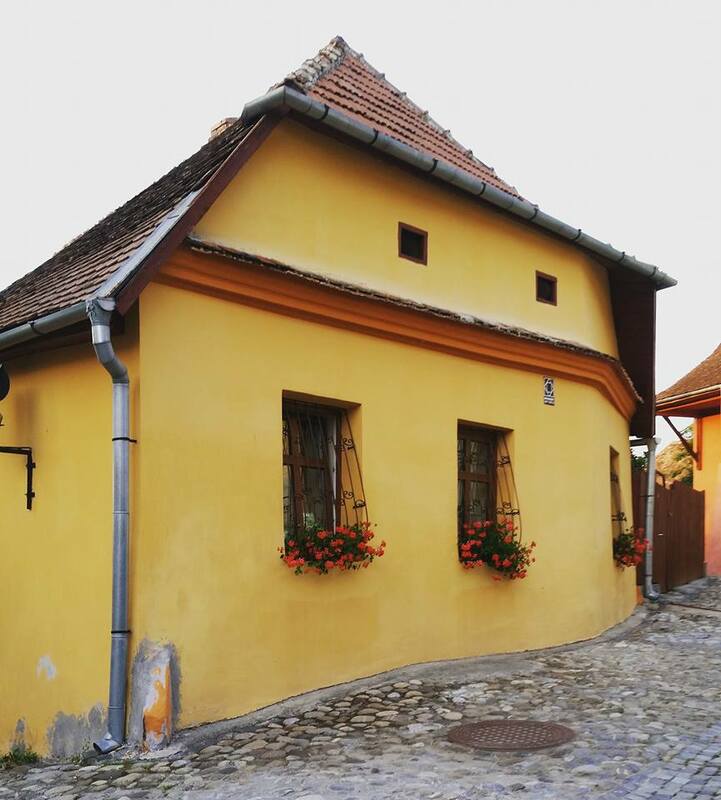 Top 8 Reasons to Book Your Next Vacation to Transylvania, Romania! 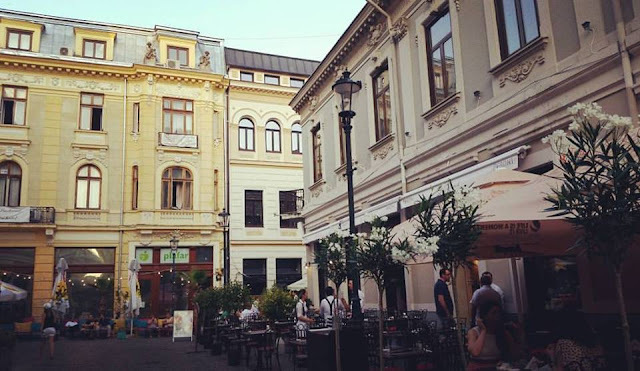 For the past five years or so, I have developed a small obsession with wanting to travel to Romania. I had seen photos and read about Transylvania here and there, and it totally piqued my interest! 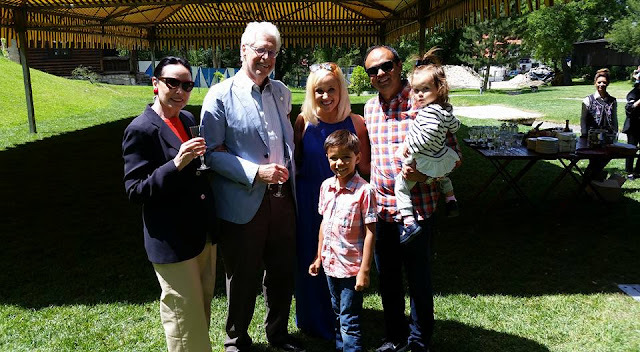 I spent about 8 months planning and booking all of the facets of this trip, and throughout that time, I frequently had people ask me, "why, Romania?!" 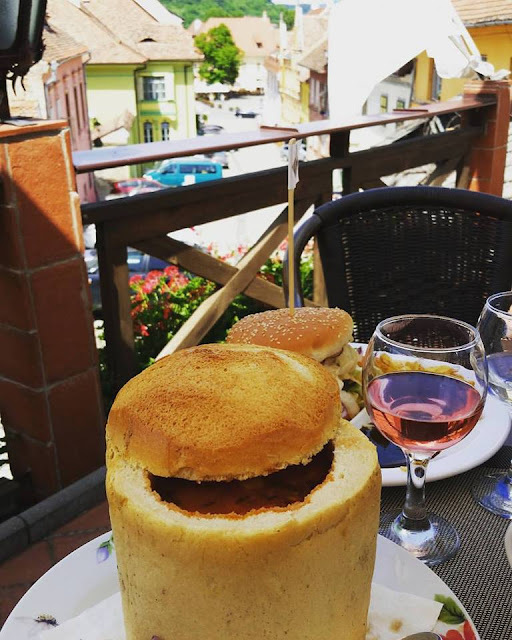 So, here are my TOP 8 REASONS why you should plan a vacation to Romania!!! 1. Ease of travel. It is incredibly easy to travel around Romania! There is an excellent transportation infrastructure. You can easily take trains around the country, but while we were there, we road tripped. And I can't recommend renting a car strongly enough! The roads and signage are excellent. They are very polite and mindful drivers. 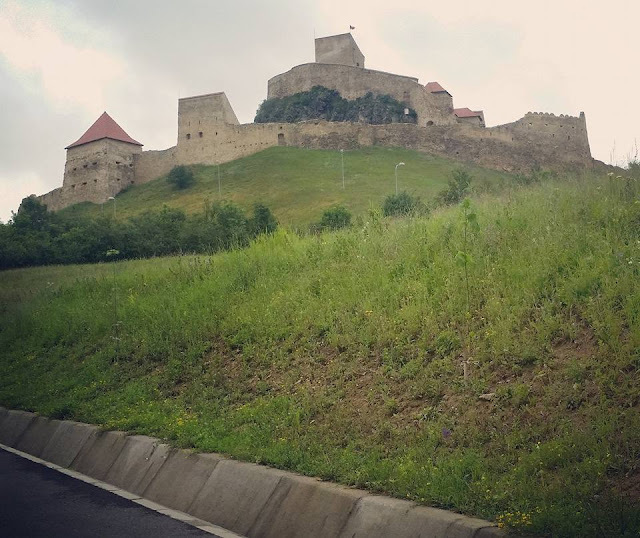 And sometimes while you're driving from Point A to Point B, you may just see a fortress on the side of the road and decide to pull over and explore for an hour! That happened to us on our drive between Sighisoara and Brasov, and it was honestly one of our best days yet! Renting a car is also quite affordable (especially if you know how to drive a manual). We do NOT know how to drive a manual, so we paid a bit more for an automatic. We also hauled around like 200+ pounds of stuff (much of it for our high maintenance little girl), so we needed a larger car. We landed on a Ford Mondeo hatchback (huge trunk) that we rented from the Intercontinental in Bucharest. The total for a week was 303 euros, including taxes, unlimited mileage and a GPS. 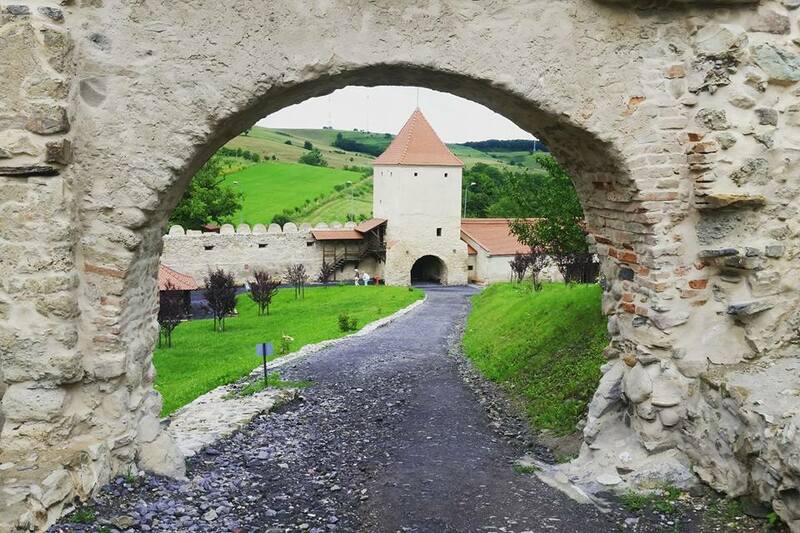 We loved the freedom to drive around Transylvania and explore at leisure, not feeling tied down to a train schedule. Especially when traveling with littles! Romania has so much to offer, and road-tripping through Transylvania will forever be a highlight for us! 2. Castles! It's like Disneyland, but without the crowds (or costs)! Romania is a country rich with castles, palaces and fortresses. They dot the landscape and are very accessible for tourists to stop and explore! We loved the history and authenticity of the castles. They have that magic, fairy-tale like ambiance that just set Romania apart from so many other countries I've visited. 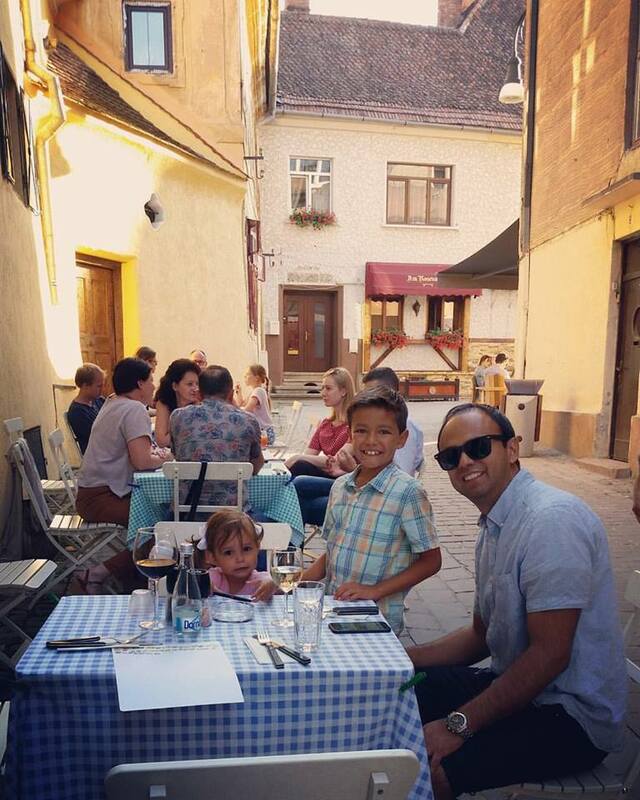 One day after our drive to Bran Castle (otherwise known as "Dracula's Castle), we found ourselves sitting in the 100-year old tea house, having lunch. We were fueling up before walking up the hill to explore the castle! 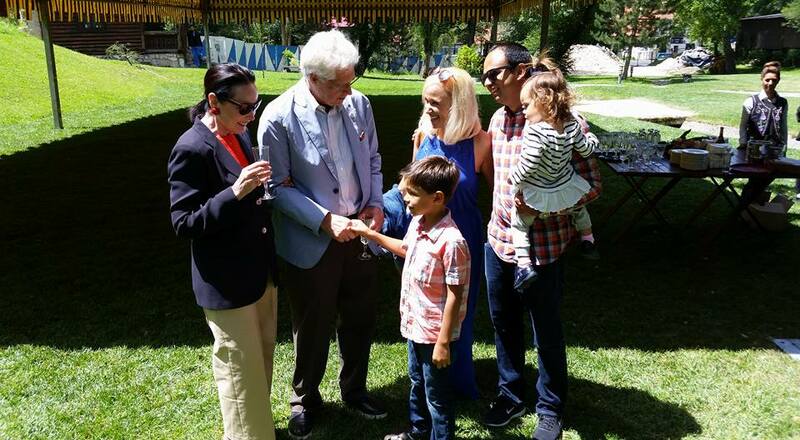 Outside the window we heard music and saw a band, and before we knew it, we were invited to meet Prince Dominic of Romania and join in his birthday celebrations! 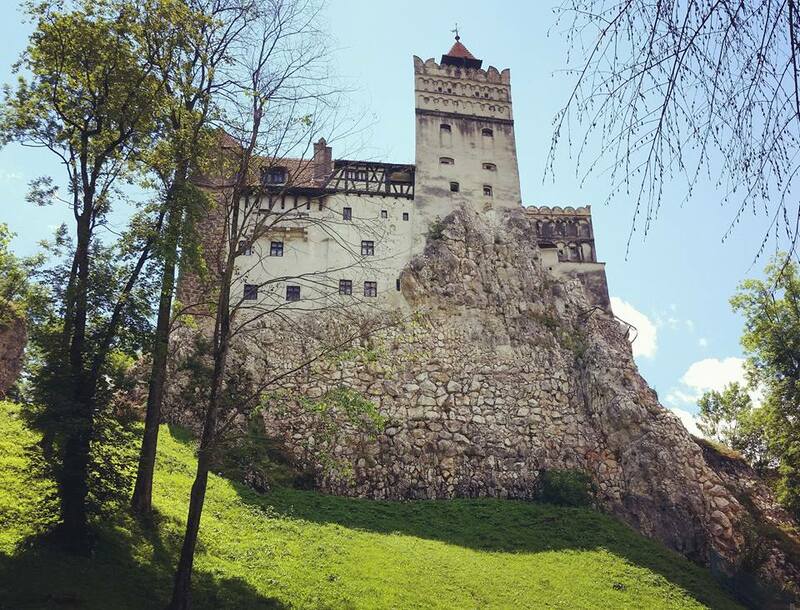 He was born at Bran Castle and lived there during the early part of his life. Whaaaat?! Again, this country is just MAGICAL. That's the only word I can think to describe it! 3. Breathtaking Architecture and Landscape. Romania is just a feast for the eyes, no doubt about it. Especially throughout the countryside in Transylvania! Once you leave Bucharest, there are fields and beautiful wide open spaces between the various towns and villages. 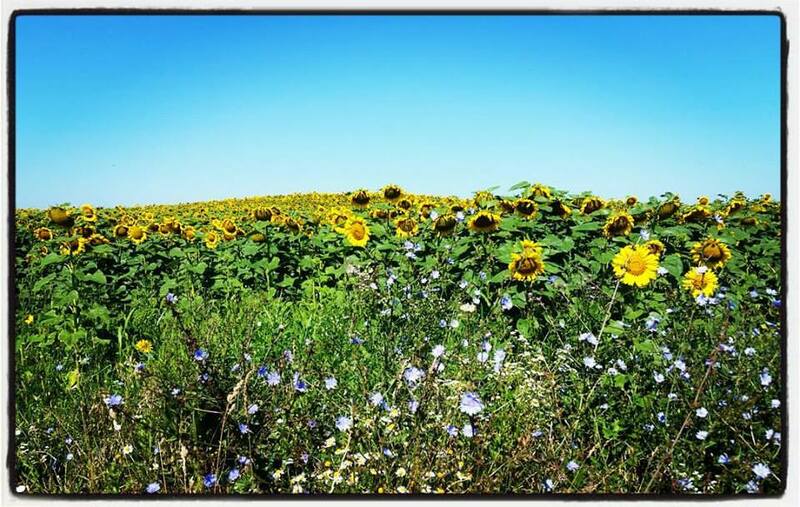 During the summer while we were there, these fields were full of blooming sunflowers! The houses and buildings are painted in a rainbow of colors that give the towns a magical ambiance. In the photo directly below, you can see the the apartment we rented for three nights in that orange colored building. 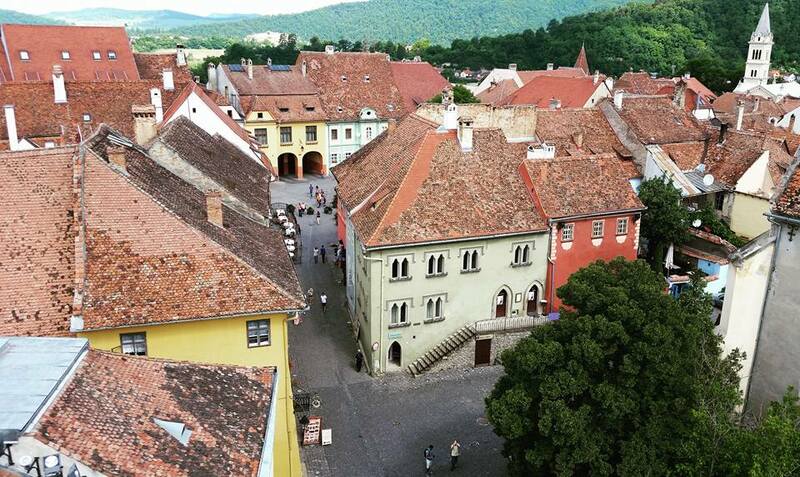 It was within the walls of Sighisoara, and just steps from the 14th century historic clock tower. 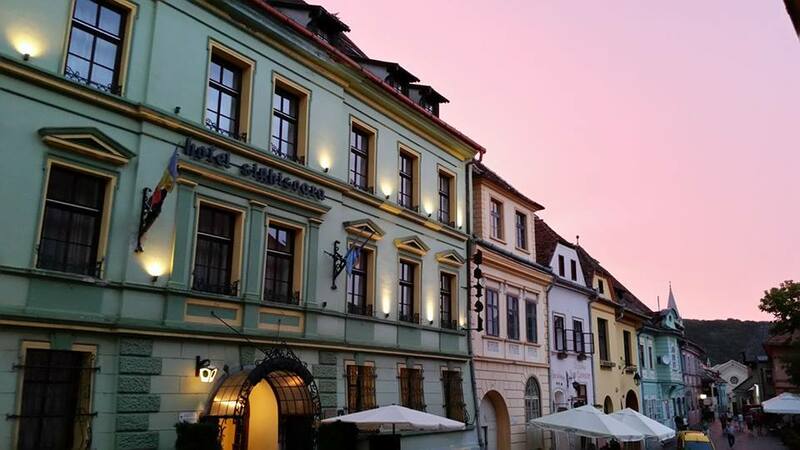 Walking down the old cobblestone streets and looking up at the old multicolored buildings was a feast for the eyes. I absolutely loved seeing how people lived, and the unique roofs on the Romanian homes! 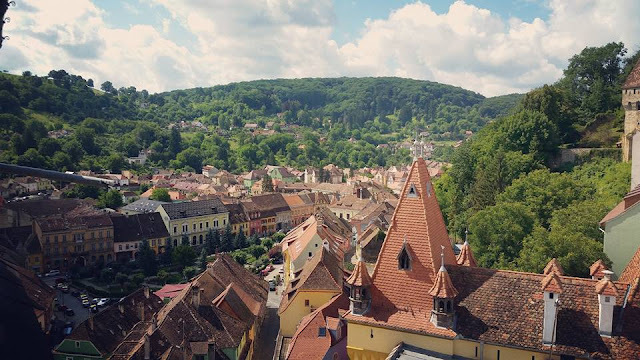 It's also quite a mountainous country, so many towns (such as Brasov, below) look like a movie set versus actual reality! 4. Affordability. 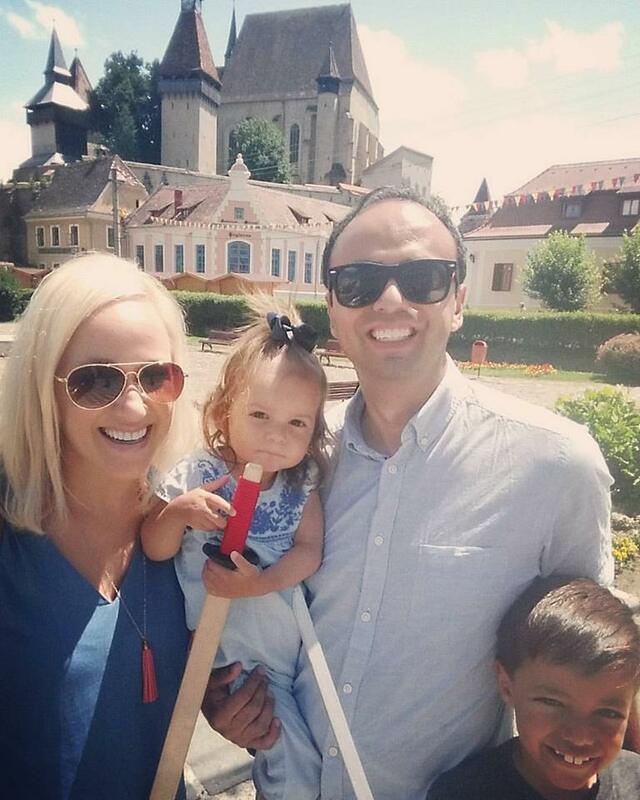 When we decided to go to Romania this summer, it was partially due to the fact that we would be flying across the Atlantic for a wedding in England. We had a little under three weeks and knew it would be extremely expensive to spend that entire time in the UK. The obvious thing to do (or so I thought) would be to simply jump on the chunnel to Paris for a week, and enjoy the rest of our vacation there. However, the wedding was in July, and I knew peak tourist season would mean extremely high prices - especially in Paris! So my husband and I started brainstorming and looking through the places on our bucket list that we knew we wanted to visit. Bucharest is actually quite easy to get to - lots of airlines flying through there several times a day. 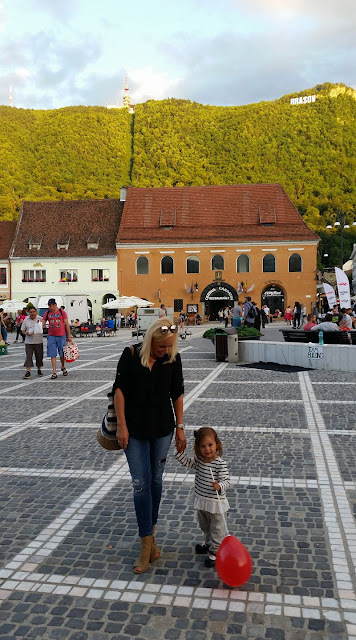 And, since Romania isn't like Italy or France (with millions of people flocking there throughout the summer), we knew we could avoid the crowds! But, what really sold me was the affordability of it all! Being a family a four (especially with a tiny, light sleeper), we had hoped to book hotel suites or 2-bedroom apartments. 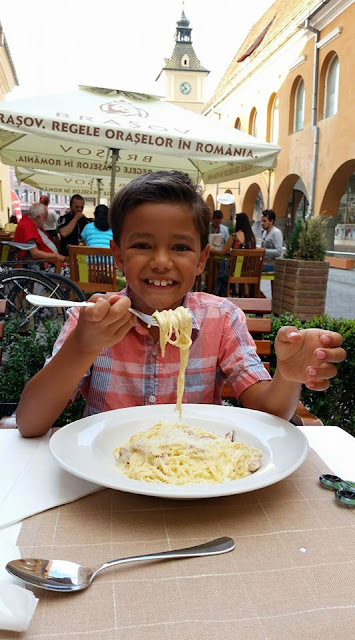 And, we were able to do that all throughout Romania for under $100/night!!! Not only were the hotels and apartments very affordable, but the food was extremely affordable! We enjoyed wonderful meals out everyday, with delicious wines (many from Moldova and Hungary), and the bill was typically $25 or less for all 4 of us! And I'm talking about picturesque, quaint restaurants! 5. Kid-friendly. Romania is a very kid-friendly country, and as a tourist, the local people went out of their way to cater to our needs of traveling with children. In fact, this is the first trip to Europe we've made with a baby without carrying any sort of pack n'play or portable crib. Every single apartment or hotel we booked had a crib set up in our room, ready for us with fresh linens. And, at no extra charge. Every little restaurant we visited had high chairs, and we never felt uncomfortable taking our children anywhere. Not only that, but the magical aura of this place coupled with the wide-open spaces, make it a dream for kids! Outside the castles we visted, there were always swords and knight costumes the kids could buy and play with. There was always plenty of room to run around, and the pace of life in Romania is just peaceful. Not rushed and stressful like other major tourist destinations. 6. Craftsmanship. The Romanians are really skilled artisans. It's fascinating to see the things they make by hand. 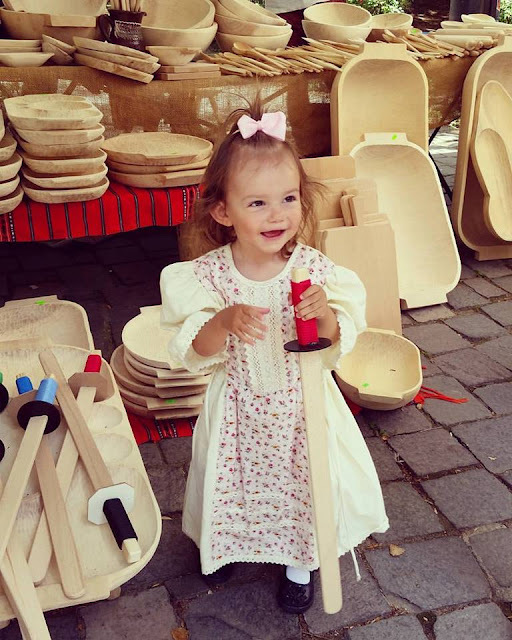 There is a lot of wood working done within the country, particularly with willow wood. 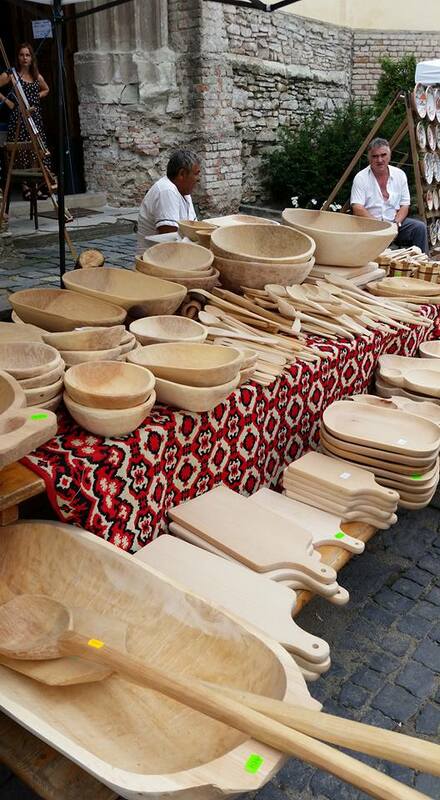 Willow wood is softer than many other woods, and the Romanians use it to make a variety of platters, dough bowls, and other kitchen goods. I fell in love with the willow-carved products while we were there. 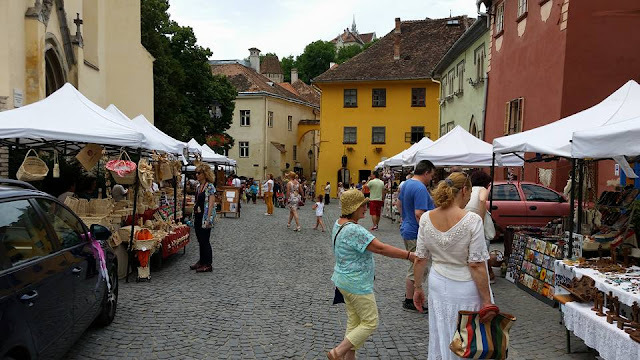 Our first night in Sighisoara also happened to correspond with their annual handicrafts market, so I got to see many handmade goods from this gorgeous country! They making amazing decorated gingerbread, straw goods, and handpainted pottery as well! 7. Religious History. The history of various religions in Romania, as well as their places of worship, are fascinating to visit. Many of the churches are simply works of art! 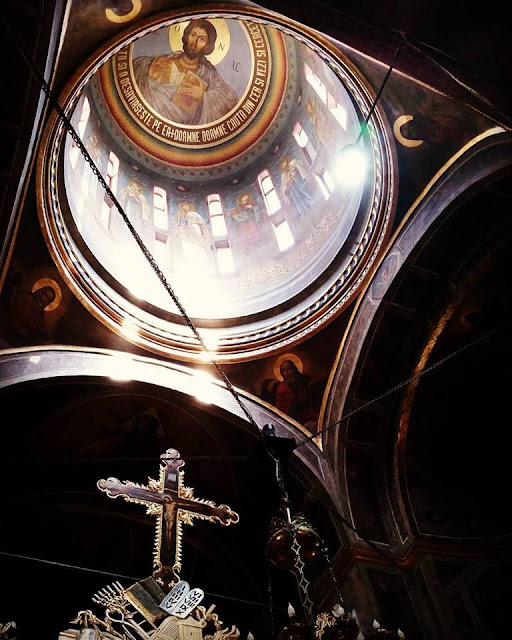 There are countless Orthodox churches throughout the country, each built with the triple domes representing the Holy Trinity. The murals and icons within these churches are breathtaking! 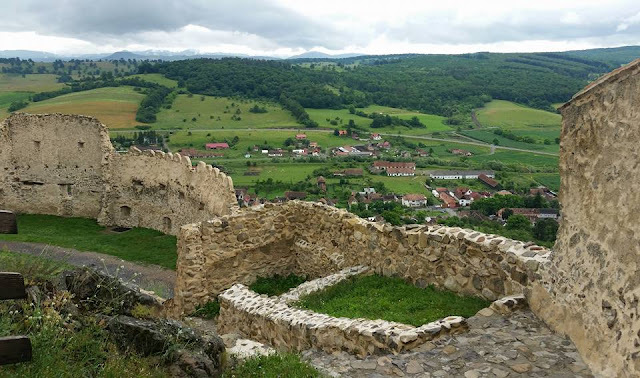 Romania is also rich with well-preserved fortified churches. 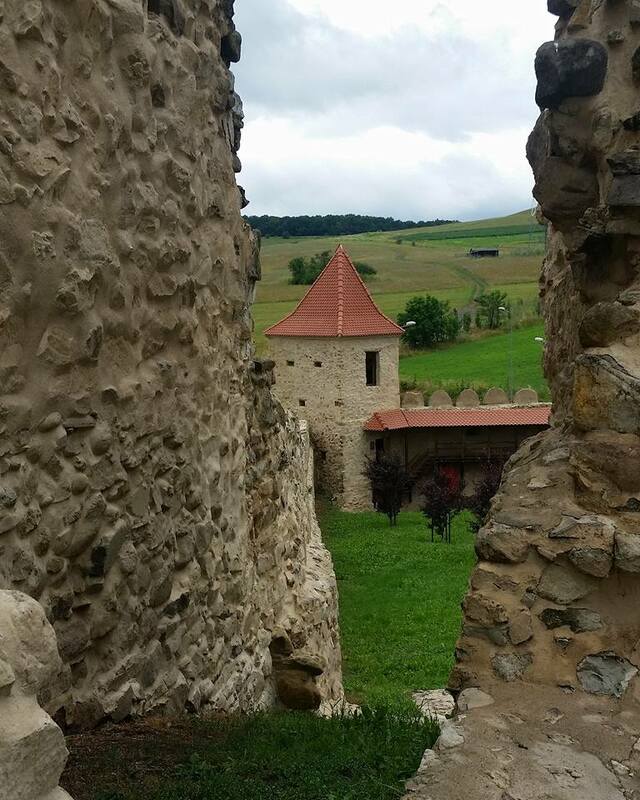 In fact, they have 7 of these fortified churches in Transylvania which are on the UNESCO World Heritage List. We were able to visit two of them (Biertan and Prejmer), and they were fascinating. Built between the 13th - 16th century by the Saxons, they give a glimpse into a way of life during that time. 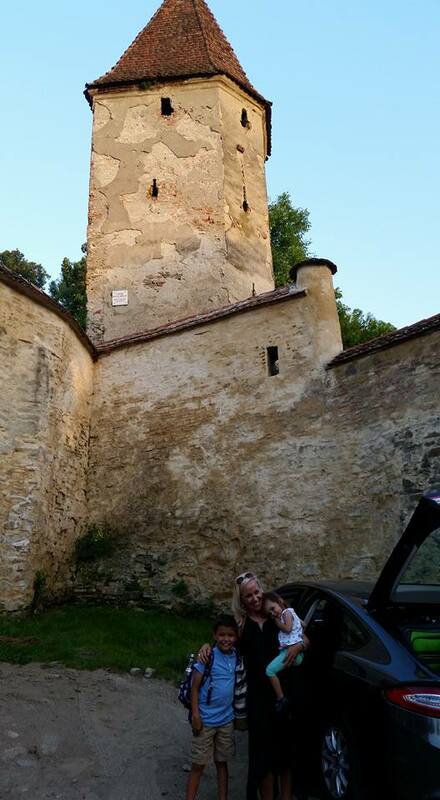 Below you can see my family standing in front of the fortification in Biertan. 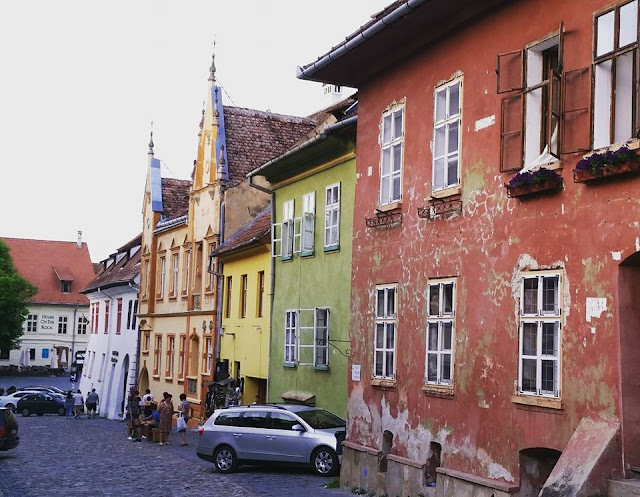 A gorgeous tiny town just 30 minutes outside of Sighisoara. The drive to this little village was lined with multicolored homes and horse-drawn carriages sharing the road with us. 8. The People. 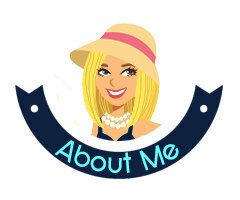 Finally, I would be remiss in talking about why you should book your next trip to Romania without mentioning the people. The Romanian people we met were very helpful and kind across the board. Even in the bustling city of Bucharest, we were met with kind taxi drivers and friendly hotel workers. 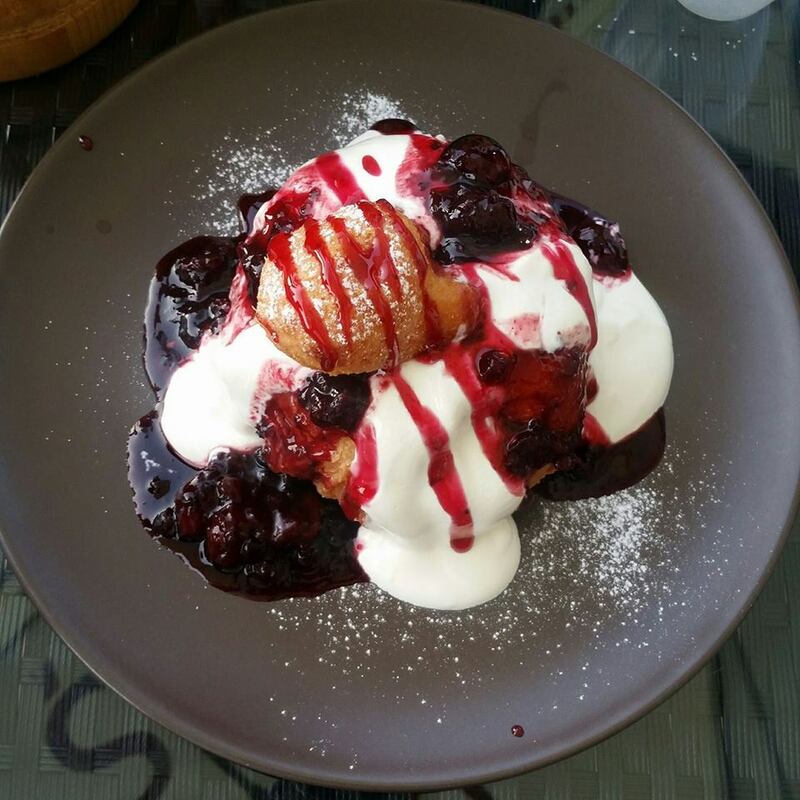 We stopped in cafes and on the street for pastries, and were always met with a smile. We also found the people very honest when it came to matters of money. I've spent a good amount of time traveling in the Middle East and Latin America, and while I love those places, the constant negotiating, haggling, and pressure to buy goods can sometimes be exhausting. We didn't experience any of that in Romania. In fact, our taxi driver in Bucharest tried refusing the tip we gave him because he "just wanted my family to have a nice time and enjoy Romania". The owner of the apartment we rented in Sighisoara had it completely stocked with tea and coffee and brought us bottled water everyday because he thought it would be better for us and the children to drink. No extra charge or anything. Just very thoughtful! 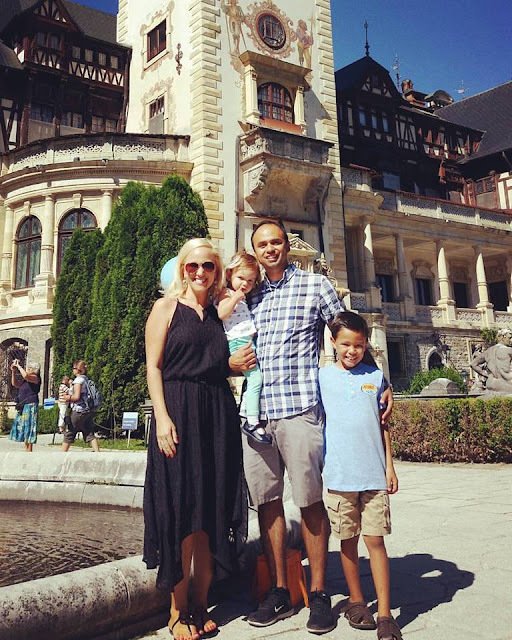 If you're considering getting a bit off the beaten path on your next family vacation, I can't encourage you enough to venture to Romania! The country has every modern convenience you could possibly want or need, yet you feel like you're walking around in a 14th century fairy tale. 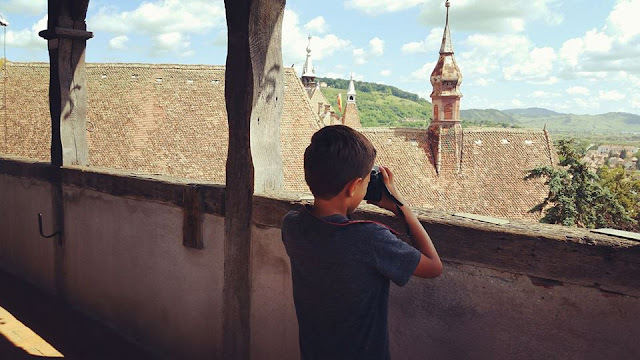 If you have any specific questions about planning a Romanian vacation, please let me know in the comments below! Hi! It looks like a wonderful place to travel! Thank you so much for sharing! I would love to get my hands on one of those wooden bowl and it looks like the children had a good time too! Gorgeous photographs.. you have convinced me..